> 8x8 Inc. > Are senior business leaders holding back tech adoption? 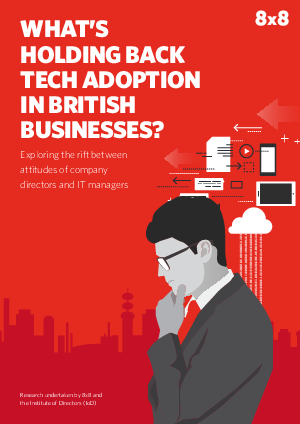 Do attitudes to IT adoption vary depending on your seniority within a business? And could this be holding back adoption of technology? These are key questions explored in this paper, which compares the views of mid-level ‘hands on’ IT managers with those of senior directors within British companies. Across both groups, there is a sense that UK business in general is too wary of implementing new technology. But there is a significant divergence of opinion when it comes to a range of factors, such as the extent to which companies invest in new technology, stay on top of the latest tech, and understand its importance to the success of the business. A pattern emerges, whereby the senior leaders within companies are far happier than middle managers with the status quo around technology adoption. And IT managers even suggest that this might be driven by self preservation on the part of senior leaders.